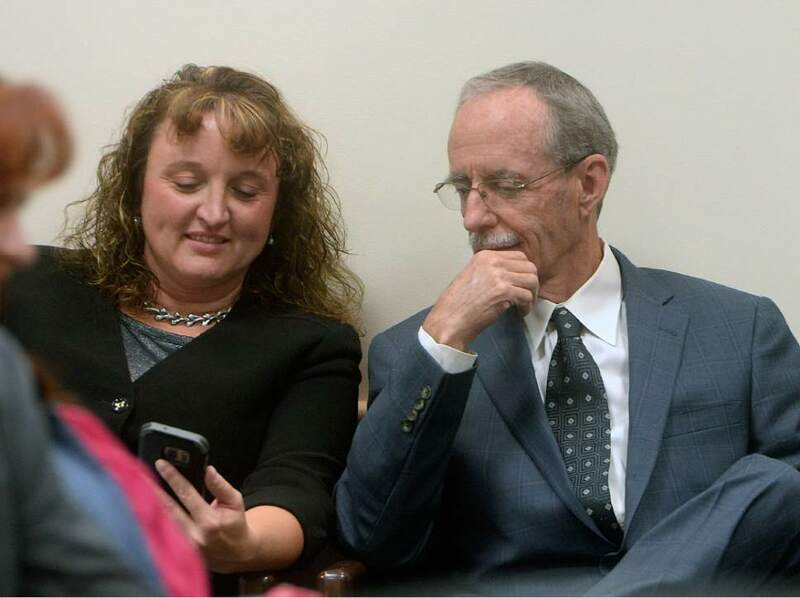 Al Hartmann | Tribune file photo Salt Lake County County Recorder Gary Ott sits with his chief deputy Julie Dole before the Salt Lake County Council's presentation of findings of the county auditor's performance review in Oct. 2016. A week later, the Salt Lake County Republican Party censured Dole, accusing her of hiding Ott's health status. 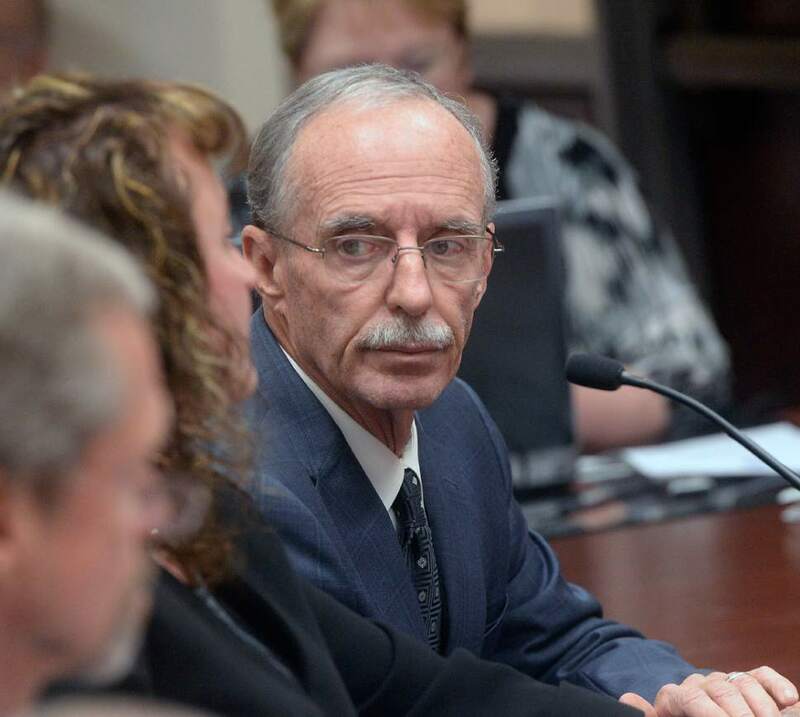 Al Hartmann | Tribune file photo Salt Lake County County Recorder Gary Ott sits with his chief deputy, Julie Dole before the Salt Lake County Council is to present findings of the county auditor's performance review Tuesday, Oct. 4., 2016. A week later, the Salt Lake County Republican Party censured Dole, accusing her of hiding Ott's health status. A judge on Friday signed an agreement between Salt Lake County Recorder Gary Ott&apos;s family and the county that allows Ott to resign Aug. 1 with "the peace and dignity to which he is entitled," a resignation that has sparked an investigation of his chief deputy by the Salt Lake County Republican Party. The order approving the settlement deal  ending more than a year of questions about Ott&apos;s mental competency  was signed by 3rd District Judge Bruce Lubeck, court records said. The agreement is between the county and Ott&apos;s sisters, Kris and Kathy, and his brother, Martin, who were recently approved as court-appointed guardians of Ott. The elected recorder has been dealing with a mental illness for months, preventing him from leading his office, although his top aides have insisted he is in charge and capable of carrying out his duties. The resignation puts in motion a process to select an interim recorder in the next several weeks before a permanent replacement is elected in 2018. But County Mayor Ben McAdams said Friday that he would push to eliminate the recorder position altogether and merge it into the surveyor&apos;s office in an effort to "save tax dollars and streamline services." Both offices deal with real estate and land issues. "We hope today&apos;s decision by the court enables Mr. Ott and his family to move forward with the privacy they deserve when dealing with sensitive medical and financial matters personal to Mr. Ott," a statement from the Salt Lake County district attorney&apos;s office said. Attorneys for Ott, his family and the county on Thursday had asked Lubeck to ratify the separation agreement, which stipulates that the county will place $35,000 into a trust account to pay for his care. The amount is equal to 12 weeks&apos; pay for Ott, whose annual compensation, including benefits, is about $190,000, according to the state&apos;s transparency website. The agreement also allows Ott, 66, to stay on the county&apos;s health insurance plan through Aug. 15. "The agreement provides for [Ott&apos;s] resignation both from his elected position and from his employment relationship with the county, so that [Ott] may retire in the peace and dignity to which he is entitled," the order states. Ott was in an undisclosed medical facility last week. The filing stated he has a "mental incapacity that is not temporary in nature." The Ott controversy went public early last year when police found Ott, wandering and incoherent, in Tooele County. In October, he apparently was unable to answer basic questions from the County Council. Since then, elected leaders have tried to remove Ott from office, but they struggled to find a legal strategy to do so. Utah law does not allow for other leaders to remove an elected official because of mental incapacity. An audit determined that the recorder&apos;s office was fulfilling its duties. Chief Deputy Recorder Julie Dole and Ott&apos;s secretary/girlfriend, Karmen Sanone, said that Ott was still calling the shots, although he rarely, if ever, came into the office. Yet in her bid to replace Ott, sent Friday to select Republicans, Dole stated flatly that she has been in charge. "Despite the struggles current County Recorder Gary Ott has been experiencing, I have been able to run the recorder&apos;s office in an efficient and effective manner." … She described herself as "honest and hardworking and willing to devote myself to service." On Friday night, the Salt Lake County Republican Party said it is investigating Dole. "Although, under Utah law, political parties have little influence or recourse upon appointed officials," the news release says, "the executive committee of the Salt Lake County Republican Party has decided to investigate Ms. Dole, who is a current member of said committee." The county party censured Dole in October, saying she made false statements in a "deliberate attempt" to assure that Ott, a Republican, was fit to do his job. But Dole said Friday night that county investigators are welcome to "bring on any investigation because they&apos;ll all show I&apos;m innocent of any wrongdoing." She is unlikely to garner support from other county leaders if she runs for the office, something she noted to reporters. "Basically the party&apos;s doing that to just destroy any opportunity I have to be elected. It&apos;s just the big GOP steamroller." Councilwoman Aimee Winder Newton tweeted that she will not back Dole. And Councilman Richard Snelgrove told The Salt Lake Tribune that it won&apos;t be long before Dole and Sanone are "gone at the recorder&apos;s office." Critics have accused the pair of hiding the recorder&apos;s disability to protect their financial interests, including during Ott&apos;s 2014 election campaign on which they worked. Dole and Sanone have denied the allegation. Dole said she&apos;s had a "professional and political relationship with Mr. Ott" and that while she&apos;s been "running" the office for the past few years, she&apos;s had very little direction from him. "I&apos;ve done what I was hired to do, and I&apos;ve done it very well, despite whatever is going on with him," Dole said. Dole, who joined the office in March 2014, one week before Ott filed his candidacy for re-election, receives compensation of $190,291, according to the Utah transparency website. Sanone, hired two days after the Nov. 4, 2014, election, is paid $70,348 in salary and benefits. One county document obtained by The Tribune showed Sanone emailing herself a "Gary Ott Trust Outline" in May 2016. Sanone said that email should have been redacted from the records provided to the newspaper because it was "a personal document that Gary had me draw up and take to an attorney." The settlement negotiated by the county and Ott&apos;s siblings waives future claims against the county but specifically excludes Dole and Sanone, as individuals, from that waiver. In coming weeks, the county GOP will nominate an interim recorder for appointment by the County Council. The recorder position would then be placed on the ballot in the November 2018 election, which is two years before Ott&apos;s term was set to expire. However, McAdams said Friday that he hoped the recorder position could be eliminated before the election. McAdams said he&apos;s considered the possibility of a merger of the recorder and surveyor&apos;s offices for some time. "This is a [recorder&apos;s] office that seems to be functioning adequately without an elected official in that position," he said in an interview, adding that "we&apos;re always looking for opportunities to save tax dollars." Under the proposal, staff in the recorder&apos;s office would report to Surveyor Reid Demman. McAdams said the Legislature would need to approve the change or give the county the power to make the change. Meanwhile, prospective candidates for the interim recorder&apos;s position are emerging. In addition to Dole, state Rep. Adam Gardiner announced his candidacy in a news release issued Friday. Gardiner, a Republican from West Jordan, quickly sent a news release Friday morning, saying he wanted the soon-to-be-vacant recorder job. Before being elected to the Legislature in 2015, Gardiner served as an aide to U.S. Rep. Rob Bishop and as a policy adviser for the County Council. He promised to use his experience to "reorganize, streamline and reset" the recorder&apos;s office, which is charged with handling real estate documents. Gardiner said he would update the office&apos;s "1980s technology," to include starting to accept credit and debit cards. Reporter Mariah Noble contributed to this story.